This section of the document applies to Microsoft Application Request Routing Version 2 for IIS 7 and Above. To successfully view and manage the cached contents on Application Request Routing (ARR). Step 1 - Browse cached contents on disk. 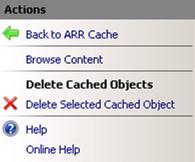 The ability to view the cached contents on ARR is a UI feature that is implemented using IIS Manager. The steps outlined in this walkthrough assume that ARR has already been configured to be used with disk cache and some contents have already been cached on ARR. To learn more about how to configure and enable disk cache on ARR, see this article. Select and expand the root of the server. In the Actions pane, click Browse Content. The contents appear similar to Windows Explorer. However, this view has an advantage over Windows Explorer in that given a host name, the contents may be cached on several drive locations based on CARP. Rather than browsing through the physical cache drive locations, the browse functionality in ARR aggregates the cached contents and provides a consolidated view. You can further navigate the cached contents by clicking on the bread crumb or double-clicking the folders. The browse functionality allows the user to view only the cached contents on the primary drives. More explicitly, it does not include the contents shown in the secondary drive. This is by design. ARR will cache both the uncompressed files as well as the compressed files based on the supported encoding by the client and the server. In addition, you may also see different segments of files due to the way the byte-range requests are supported in ARR. Step 2 - Delete cached contents. In the above example, selecting any one of the files will remove all of the files that are associated with example.jpg. The selected cached content(s) will be removed from both the primary cache drive location(s) and the secondary cache drive location, if configured. While browsing, select a folder or a file that you want to delete. 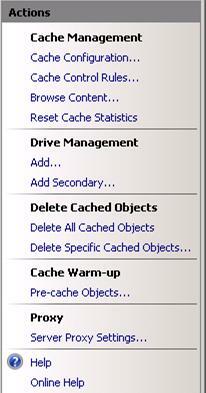 In the Actions pane, click Delete Selected Cached Object. The cached content has been removed from both the primary cache drive location(s) and the secondary cache drive location, if configured. You have now successfully browsed through the cached contents on disk using IIS Manager. You can also select and delete cached content(s) while browsing. For other ARR Version 2 walkthroughs, see the documents in this article.